Great homemade Italian food isn't about strict recipes—it's about picking the best ingredients and getting the most out of them. We went into the kitchen of veteran home cook Camille Parisi to learn some essential tricks. Italian-America food traditions are, at their heart, all about family. Meals are long, and appropriately so—the gathering is as much about eating as it is about camaraderie. Everything revolves around the kitchen, and the cook rules—what she says, goes. And what she makes, well…everyone eats. 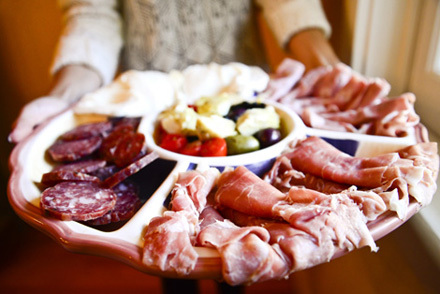 It all begins with antipasto, prepared at the cook’s whim (there is no wrong way to make antipasto), and ends with espresso and cookies—often hours later. Though there is joy in the simplicity of red-sauce fare, there are also nuances impossible to glean from television or cookbooks. One must enter the fray, mix it up, and learn first-hand from a pro. Camille Parisi, a top-shelf home cook, welcomed us and shared her secrets for perfect meatballs and eggplant parmesan. Her lessons are passed down from her grandmother, with whom Camille lived during a rich childhood in the Bronx, but they are peppered with her own personal inventions. Italian-American cooking is, after all, always evolving, generation to generation. Draw from Camille’s lessons and forge your own traditions. 1. Always use San Marzano tomatoes and nothing else for making pasta sauce. Let's call this the Golden Rule. 2. Use extra virgin olive oil, preferably imported. "If not, Filippo Berio makes a great one for cooking." 3. Make sure your garlic and onions are fresh. "They are the foundation for any good sauce or Italian dish and if they're stale, your dish will be ruined. Same applies to herbs like basil and oregano." "When buying eggplant, always look for the lightest one you can find. A heavy eggplant will be filled with seeds, and seeds lead to bitterness." "I have never baked mine. I think it leads to them being dry and I don't like the consistency. I also use bread in mine. I cut a loaf that is a day or two old, soak it in milk, and incorporate it into my meat mixture for meatballs. Additionally, I roll my balls in Italian bread crumb before frying so they have a nice crust." 6. Do not cut corners on your meatballs. "Meatballs must be made of a mixture of beef, pork, and veal—I have mine ground at Biancardi’s on Arthur Avenue in the Bronx." 7. Fennel equals better flavor. "Use high-quality sausage that has fennel in it. If using sausage in a red sauce, always use sweet, not hot." 8. Always use an appropriate noodle. "You want a thick noodle to hold your meat sauce, like pappardelle or bucatini. Anything else will be too flimsy and won't hold up." "If you're cooking eggplant parm, you can't use a heavy meat sauce or Bolognese. You need a separate, lighter, marinara sauce. The meat sauce is reserved for pasta noodles." "Put yourself into the meal. If you are cooking for a group of folks, chances are they matter to you and it will make the experience that much more rewarding." Bonus Rule: Always serve coffee. "The end to every good meal is a great cup of espresso. I get my beans from a shop on Arthur Avenue, Cerini." Page 2. Use extra virgin olive oil, preferably imported.